Lowest ever price on both the 6L and 4L pressure cookers by Tower. Each come with 10 years manufacturer's guarantee Take to checkout for offer. 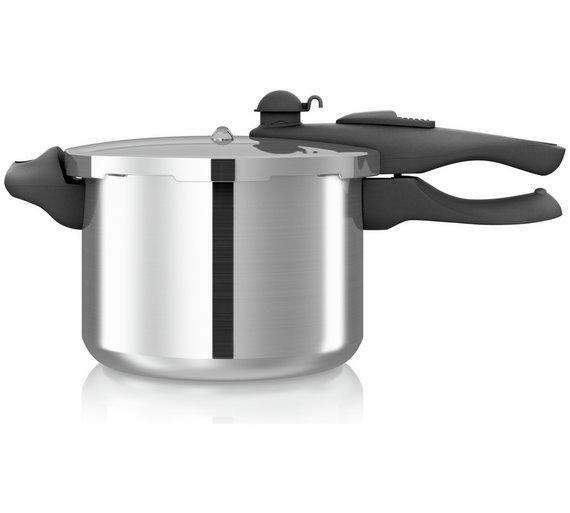 Join the pressure cooker revolution with this 6 litre s/steel pressure cooker from Tower. Uses 90% less fuel & cooks food quicker than conventional cooking methods whilst preserving 95% of the vitamins & nutrients. The 6 litre capacity makes it ideal for one or the whole family whilst the easy clean cooking pot means lees time spent washing up. 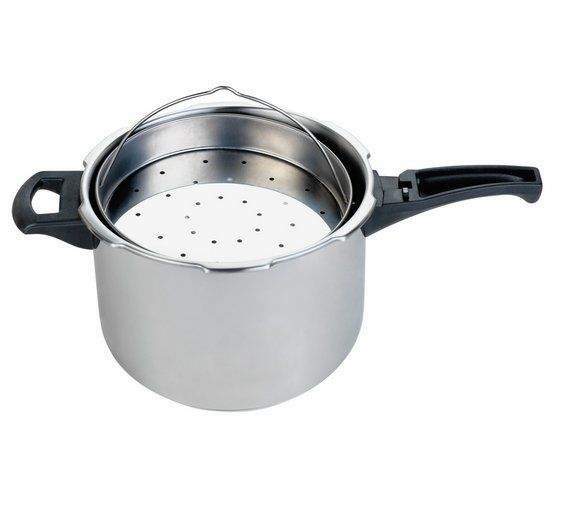 Complete with a stainless steel basket and stand for optimum convenience, this pressure cooker is suitable for all hob types including induction. Visual pressure indicator raises to indicate when cooker is at pressure. Mechanical lock prevents the lid from being opened when the contents are under pressure. Quick click & lock locking system. Suitable for hob types electric, gas, ceramic, halogen, induction and solid hotplates. Trivet to protect your worktop. 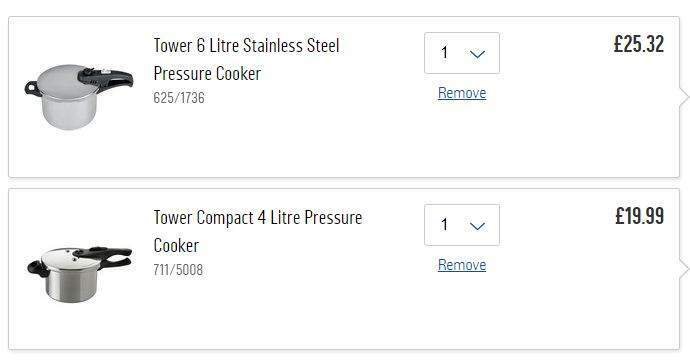 Tower 4 Litre Pressure Cooker Aluminium Visual pressure indicator raises when cook Includes steamer basket and stand Bonded steel base for use on induction Suitable for hob types including induction. Click and lock locking system. Sam, define acidic foods by a few examples, otherwise there is zero context, it is easy enough to ue an aluminium one for the basics (everyone should have a pressure cooker) ...though many these days are simply better off with an instantpot, which is near enough "fill & leave" in terms of simplicity. NB had an aluminium sigg for decades, not tended to put acidic drinks in (which can include fizzy, or simply neglected & fermenting soft drinks) ..no problem, you are at more risk walking your kid along ICE vehicle polluted streets of any big busy road than the aluminium leachate scaring you'll hear all over the place, ...& don't get me started on how much of particular nasties are used to set in place a vaccine compared to levels for tap water of various chemicals we are all told to be super cautious of. Be more wary of the motor car, pollutants, commuting in tube stations (brake dust, greases & the like) etc etc, (or at least research them so you know the fuller picture). Sam, define acidic foods by a few examples, otherwise there is zero …Sam, define acidic foods by a few examples, otherwise there is zero context, it is easy enough to ue an aluminium one for the basics (everyone should have a pressure cooker) ...though many these days are simply better off with an instantpot, which is near enough "fill & leave" in terms of simplicity.Folks..NB had an aluminium sigg for decades, not tended to put acidic drinks in (which can include fizzy, or simply neglected & fermenting soft drinks) ..no problem, you are at more risk walking your kid along ICE vehicle polluted streets of any big busy road than the aluminium leachate scaring you'll hear all over the place, ...& don't get me started on how much of particular nasties are used to set in place a vaccine compared to levels for tap water of various chemicals we are all told to be super cautious of.Be more wary of the motor car, pollutants, commuting in tube stations (brake dust, greases & the like) etc etc, (or at least research them so you know the fuller picture). But depending on dish what you cook , def Stainless much safer that Aluminium. For a start , Lime which is used in almost all food can cause alumunium to release its structure to fodo . Read some where , take weight of ur aluminium cooker when bought and after 3 or 4 years , u will see a weight difference. for certain items an inner bowl may suffice to avoid any fear of leachate potential, & carry on as before. Just got it as a replacement to our years old Prestige... Looks wise OK but quality handle and the plastic lock on top of the handle looks very cheap and will surely break in few months time. Some Amazon reviews complained about it saying that it takes too long to cook and also on the bad Customer Service from Tower., I am thinking to return it and buy a trusted brand like Prestige. Got to love these. Pressure cookers rule. Plastic quality is suspect indeed as I received one with already broken lid plastic in box ! Argos have exchanged it but meant 3 trips to store. Just got it as a replacement to our years old Prestige... Looks wise OK …Just got it as a replacement to our years old Prestige... Looks wise OK but quality handle and the plastic lock on top of the handle looks very cheap and will surely break in few months time.Some Amazon reviews complained about it saying that it takes too long to cook and also on the bad Customer Service from Tower., I am thinking to return it and buy a trusted brand like Prestige. Prestige is not Prestige any more. 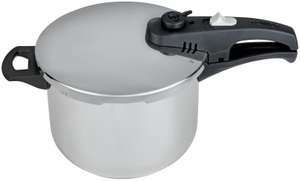 I had reason to contact them recently with a query over their 6L Stainless Steel pressure cooker. They are now a company called Meyer who bought the Prestige company a few years ago but retained the name. Cannot comment on the quality now but likewise we have had many years (could be as many as 25 years) good use out of our 6L aluminium pressure cooker & have thought of moving over to stainless steel, the problem with the stainless steel pressure cookers are they only do 2 pressures & 12 psi is the highest so, keeping the aluminium one going, just replacing the gasket every few years is our decision.